Denim is probably the most versatile fabric ever invented. Young or old, tall or short, fair or dark-skinned, skinny or chubby–denim suits everybody. In fact, I don’t know anyone who doesn’t own a piece of denim clothing. So what do you do to make an already well-loved fabric even better? Make it 100% organic. In keeping with Muji’s no-excess, minimal design philosophy, the brand launched its Cotton Denim Series–an entire collection of ladies’ and men’s garments made and produced with 100% Organic Cotton. So just imagine, the comfort of organic cotton plus the durability of denim merged into one. How awesome is that? Muji’s Cotton Denim Series is composed of different styles in figure-flattering silhouettes ranging from skinny to boyfriend. Aside from jeans, ladies can choose among skirts, tunic dresses, shirts and shorts as well–all in classic and simple designs that are easy to mix and match and are true to Muji’s signature aesthetic. I chose to style my Cotton Denim shirt and skirt all preppy and feminine to show you just how versatile denim pieces are. People always label denim as too casual and laidback. I beg to differ. Denim can also look smart and scream understated elegance. You just need the right mix. P.S. Muji is currently offering 20% off on all its regular trousers, jeans and shorts are now. You can also get 25% off on any denim piece for every purchase of any regular garment item until. Follow Muji Philippines on Facebook for more details and updates. Can I just say something crazy? Can I have your Gucci heels? Hahaha! Lol. I’m in love with the color and style. LOL! NOOOOO :) Love them too much! Thanks Clariss! Yan kasi! Absent! Thanks Maebs! Glad you’re back! Love this Miss Camille! :) Yah, when i wear denim on denim, i combine different colors so it woudnt be too obvious that im denim all over :D I envy the shoes, A LOT! Thanks Mary Ann! That’s a nice trick! This looks lovely Camille and I just tried on a denim top myself and it is great and I bought some new jeans as well. Denim is becoming my fave now. Wow, I never thought there was such a thing as organic denim. Ha! You look amazing. Camille! You are my style inspiration. Thanks for posting your ootds. More tips on how to dress up this summer. 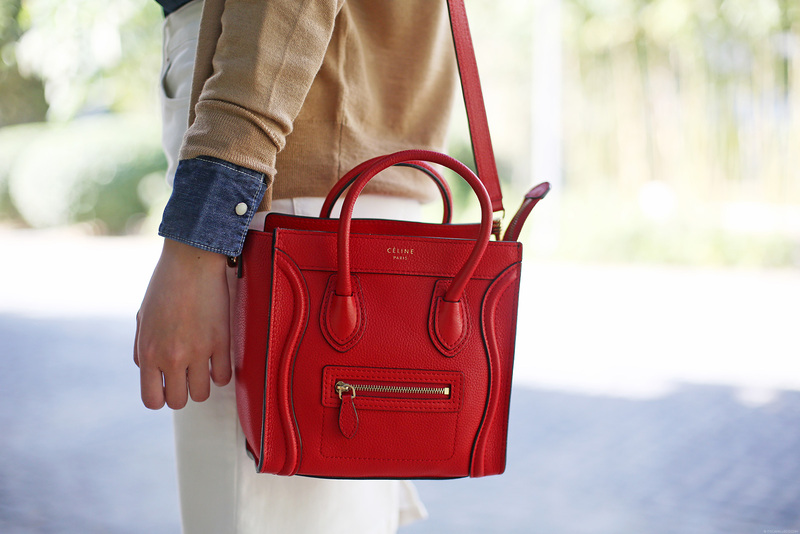 Stunning pop of red! I love this outfit! Wow! It’s been awhile since you post a formal/office attire AND on the actual day you wore it! Not a backlog post! It’s so refreshing in a way especially this outfit! I have this “Why I haven’t think of that?” moment! Hahaha! I didn’t realized it was a denim skirt at first especially on your IG post :)) anyway, love your outfit as always and very timing for summer! You noticed! Real time for a change! :) Thanks Kay! Hi ate “Versatile Camille”! Why do you always look so elegant? Pretty as always tho.